The Mars Camera, CaSSIS, on the ExoMars Trace Gas Orbiter captured its first high resolution images of the Red Planet last week. The Bernese camera worked almost perfectly and has provided spectacular views of the surface. CaSSIS (Colour and Stereo Surface Imaging System) has been developed by a team from the University of Bern led by Prof. Nicolas Thomas from the Center of Space and Habitability (CSH). It was launched with the European Space Agency’s ExoMars Trace Gas Orbiter (TGO) on 14 March 2016. TGO entered orbit around Mars on 19 October. The onboard camera, CaSSIS, has returned its first images from orbit. «The first images we received are absolutely spectacular – and it was only meant to be a test», says Nicolas Thomas. The video shows some of the images acquired. It also illustrates how CaSSIS takes data by taking images in colour simultaneously. It also includes the spectacular fly-over of Hebes Chasma. This data was the highest resolution acquired by CaSSIS (2.8 m/px) during the closest approach and is shown at half the speed at which the data were acquired. These will be among the closest images that will ever be taken of the planet by TGO, given that the spacecraft’s final orbit will be at around 400 km altitude. © ESA/Roscosmos/ExoMars/CaSSIS/UniBE. TGO is currently in a highly elliptical orbit of just over 4 days duration. The spacecraft comes within 250 km of the surface for a very short period but then goes out to over 100’000 km from the planet. CaSSIS has imaged during two of these close approaches to test its capabilities and functions. The first approach occurred on 22 November. «A lot of public attention has been on the failed landing of Schiaparelli, but TGO has been working really well so we have been extremely busy in the past month», says Nicolas Thomas. The Bern team has spent much of the time planning the observation sequences for the two close approaches. A total of 11 images were returned during the first fly-by. The spacecraft passed over a region called Hebes Chasma at its closest approach. Other data have been acquired to improve the quality of the data after post-processing. The resulting image quality has impressed the entire team. «We were quite nervous but it looks as though almost everything functioned as we planned it. The resulting images are really sharp», says Antoine Pommerol, co-investigator of CaSSIS at Center of Space and Habitability (CSH) of the University of Bern. The colour and stereo capabilities of CaSSIS were also successfully tested. «The techniques for producing stereo from this type of data are still being developed but our Italian colleagues from the Astronomical Observatory of Padova (INAF), who are experts in this field, were able to produce a first result in just a couple of days in spite of it being very challenging», says Thomas. A 3D reconstruction of a region in Noctis Labyrinthus was produced from a stereo pair of images. This first analysis shows one of the steep-sided slopes characteristic of the region. The test of colour was also successful. However, the first pass was over the region with the big volcanoes. The surfaces are covered with dust so there are few colour changes evident. «We will have to wait a little until something colourful passes under the spacecraft», says Thomas. Until then, the pictures will be black and white. Eventually, TGO will use «aerobraking» (skimming into the atmosphere) to slow the spacecraft down and enter a roughly circular orbit 400 km above this surface. This process will start in March 2017 and take around 9-12 months. The primary science phase will start around the end of 2017. CaSSIS will then enter nominal operations acquiring 12-20 high resolution stereo and colour images of selected targets per day. The imaging technique used by CaSSIS is called “push-frame”. It takes short exposures (framelets) at a very rapid rate and these images are put together on ground to produce the final product. 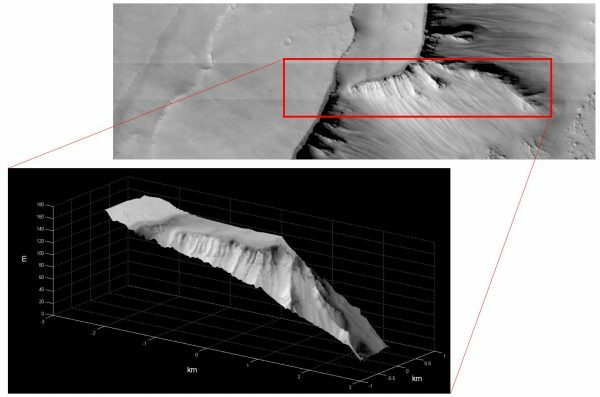 For Hebes Chasma, the framelets were acquired with 700 microseconds exposure time at a rate of one framelet every 150 milliseconds. The high resolution imaging system is designed to complement the data acquired by the other instruments on TGO and other Mars orbiters while also enhancing our knowledge of the surface of Mars. It is now known that Mars is more dynamic than previously thought. Of particular interest to the 25-strong science team from 9 countries (incl. US and Russia) is the chance CaSSIS offers to study changes that occur over the day and over the Martian seasons. Further studies of possible liquid water on the surface will be one of the main aims. CaSSIS will also support the other instruments on TGO by trying to identify sources of trace gases, including methane which is a short-lived molecule seen in the Martian atmosphere first by ESA’s Mars Express spacecraft. The project is a cooperation between the University of Bern, the Astronomical Observatory of Padua, and the Space Research Center in Warsaw with the support of local industries and funded by the Swiss Space Office (SSO), the Italian Space Agency (ASI) and the Polish Space Agency (POLSA). The structure, onboard computer, and rotation mechanism were built by the University of Bern. The telescope was built in Zurich by RUAG Space AG. The detector and read-out electronics were developed by SELEX-ES in Campi Bisenzio, Italy. The power converter was produced by the Space Research Center in Warsaw. The flight software was developed by SGF Ltd. in Budapest, Hungary.